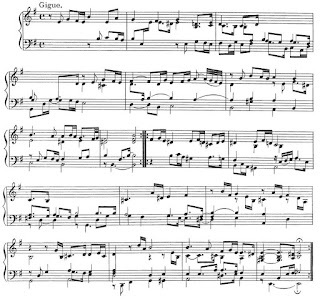 Bach's Cello Suites, Editor's Notes: How do we play the Gigue of Partita No.6 ? How do we play the Gigue of Partita No.6 ? 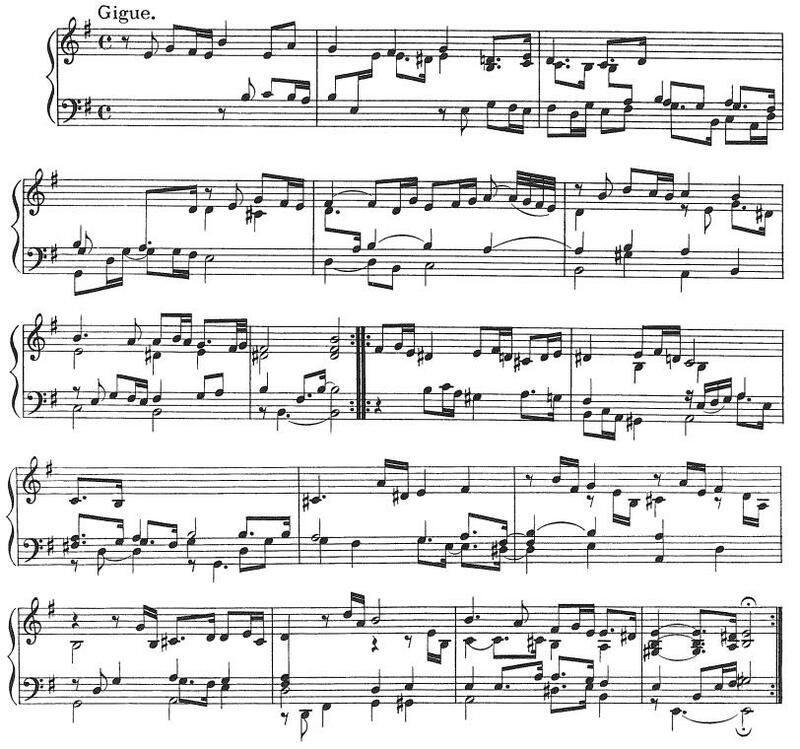 Bach wrote two Gigues in binary notation, usually written in ternary (3/8, 6/8, 12/8, etc.) 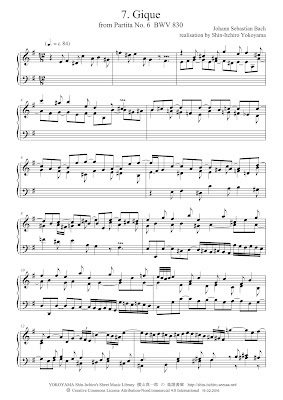 : in "French Suite" No.1 (BWV 812) and in "Partita for keyboard" No.6. The time signature of "French Suite" is 2/2 (2 half notes in a bar) but that of "Partita" is most unusual 2/1 (2 whole notes in a bar) ! But in the autograph of 1725, he wrote it in 2/2. I don't know why Bach changed time signature when he engraved it. Probably he wanted to avoid to be played too fast. But in his original idea, both Gigue has same signature, so we must not play that of "Partita" too slowly. But most interpretations of this Gigue are very very slow. Why ? Because they play it in binary rhythm as it written. No, no, it is a Gigue ! So it must be played in ternary rhythm. 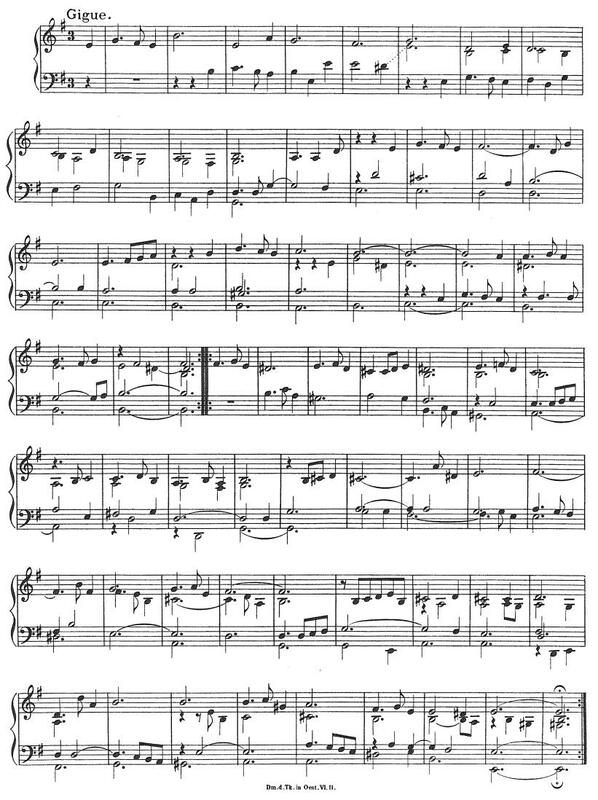 Binary notation of gigue is a tradition from the time of Froberger (1616 - 1667) but practically, it was played in ternary. 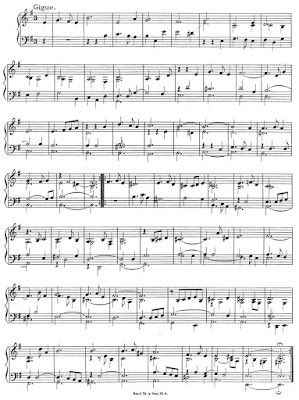 Very interestingly, Froberger wrote the same gigue in two notations: in binary (4/4) and in ternary (3/4). We can consider the latter is the realisation of the former. So, we will try to play Bach's "Gique" (according to his spelling) in ternary. I show you the 1st page of my realisation. It is better you continue it. It will be a very interesting puzzle ! Complete score of my realisation is in IMSLP. Of course, my realisation is an example. There will be plural possibilities especially in the series of four 8th notes. I can't believe no one played it in this way during probably 200 years ! 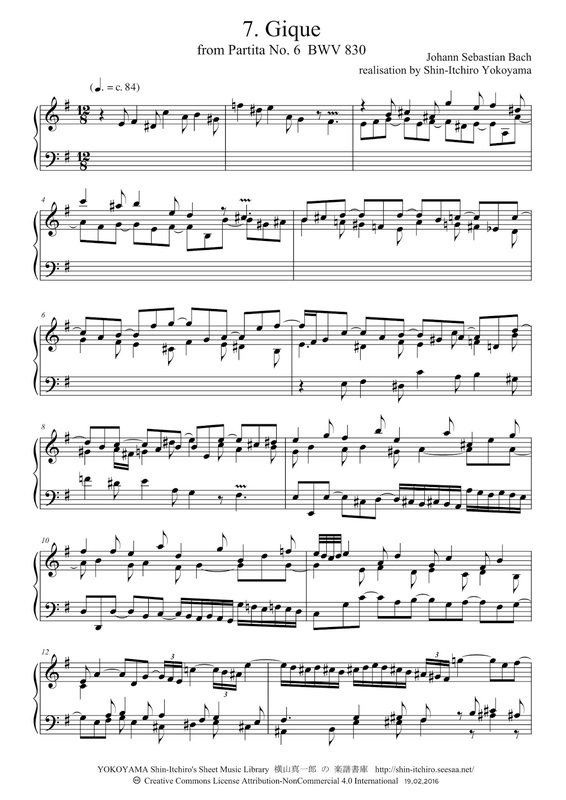 This is a Gigue, why no one tried to play as a Gigue. Yes, I know some players (such as Trevor Pinnock, András Schiff, etc.) play it in "ternary". This approach was proposed firstly by Howard Ferguson and after by Meredith Little and Natalie Jenne in their "Dance and the Music of J. S. Bach". But to be precise, it isn't ternary but senary because a half note is divided in six. So we can say it is still binary because a half note is firstly divided in two and then is divided in three. It is mere notes inégales or swing, not ternary nor Gigue. Very interesting story. Thanks for the post.